Happy 10th Birthday, Texas ScholarWorks! Texas ScholarWorks (formerly the University of Texas Digital Repository) went into production in September 2008. Texas ScholarWorks (TSW) was created to provide open, online access to the products of the University’s research and scholarship, preserve these works for future generations, promote new models of scholarly communication and deepen community understanding of the value of higher education. In honor of our first 10 years, we’d like to share some samples of the kinds of important work being shared in TSW. Dance professor, Yacov Sharir, has donated his archive of videos and documents related to performances, rehearsals, workshops and events that span his four decade career at UT. UT Libraries digitized the contents of this collection and worked with Dr. Sharir, Beth Kerr, and Katie Van Winkle to describe the materials. The resulting collection in TSW is a treasure trove of information about the dance community in Austin. UT Communications professor, Robert Hopper (1945-1998), recorded thousands of hours of everyday conversations between people over the phone, in recorded messages, and in person. Approximately 200 hours of those recordings, and their associated transcripts, are available in TSW. This is a unique collection for those who study spoken language. The Center for Electromechanics (CEM) has chosen to share their conference proceedings, publications, and reports via Texas ScholarWorks. CEM is a leading applied research unit on campus and their researchers are recognized experts in advanced energy storage and power generation rotating machines for both intermittent and continuous duty applications. Waller Creek, a tributary of the Colorado River, goes through the UT campus and is a focus of research for people at UT and in the Austin community. In an effort to improve the efficiency of finding information about Waller Creek, researchers have chosen to use Texas ScholarWorks as an archive for the publications, data, maps, images and class projects about the creek. Perhaps the most unique materials any university collects is their collection of theses and dissertations. UT Austin has over 60,000 theses and dissertations, and almost 23,000 of them are available in TSW. In fact, one of our most downloaded items in TSW is a masters report by Andrew Dapprich about starting up a gym. Before his death in 2006, club owner and Austin music scene icon Clifford Antone brought his vast knowledge of music — more specifically the blues and rock and roll — to the Forty Acres for a lecture series hosted by the Department of Sociology called “The History of the Blues According to Clifford Antone.” The series of lectures was recorded and resides both in the collection of the Fine Arts Library and online at Texas ScholarWorks. Photograph from the Sharir Collection taken between 1980-1996. The process of making content available in TSW is a team project and has been from the start. The launch of TSW was the work of Project Institutional Repository Implementation (IRI) which started in early 2008. Over the course of approximately one year, the Project IRI team contributed 4,505 hours of work towards the launch and promotion of TSW. At the conclusion of the project in January 2009 there were 5,961 items in TSW. Today we have over 58,000 items. You can find documentation from Project IRI in TSW. Many thanks to the Project IRI team, current UT Libraries staff working on TSW, and our partners at Texas Digital Library. Sharir dancers. Photographer: Jonathan Leatherwood. Choreographer, dancer, artist and teacher Yacov Sharir recently donated his archive to the Fine Arts Library. Sharir moved to Austin in 1978 where he founded the American Deaf Dance Company and was hired on as faculty at UT shortly thereafter. He developed a dance program that has become a model for universities across the country, founding the university’s professional company-in-residence, the Sharir Dance Company, in 1982, which became Sharir+Bustamante Danceworks (SBDW) in 1998. The lengthy project of processing the collection of materials from Sharir’s professional career required the persistence of graduate researcher Katie Van Winkle, an advanced degree candidate in the College of Fine Arts. Van Winkle took time to answer some questions about the project and her impressions of the experience. Tex Libris: How did you get involved in processing the Sharir archive? Katie Van Winkle: I’m a Ph.D. candidate in Performance as Public Practice (PPP), a program in the Department of Theatre & Dance. When I began my studies in the fall 2013, a fellow PPP student named Cassidy Browning was working with Dr. Sharir as a research assistant. Cassidy moved on to dissertation work, and recommended me as a replacement, just as Beth Kerr (Theatre & Dance Librarian in the Fine Arts Library) and Dr. Sharir established the archive project. I have found always physical and digital archives invaluable in my work both as a scholar and as an artist–but I have almost zero training in archival work. At UT, I participated in a one-day workshop with the American Theatre Archive Project (ATAP), and a theory-based course on “Archive and Ephemera.” Instead, I have some experience in inventing and implementing technological solutions for arts management: for example, as a Dramaturgy Fellow at Center Stage in Baltimore I developed an early prototype of the National New Play Network’s New Play Exchange (http://nnpn.org/programs/new-play-exchange) through a Dramaturgy-Driven Grant from the Literary Managers and Dramaturgs of the Americas. What did the process consist of? What was the scope, and how much in terms of materials and types of materials were there? KVW:The Sharir/Sharir+Bustamante Dance Collection is a gift archive from Dr. Sharir to UT’s Fine Arts Library. It consists of video documentation of many hundreds of dances between 1977 and 2015, as well as paper documentation (programs, photographs, press clippings, etc.) of the work of the American Deaf Dance Company, the Sharir Dance Company, and Sharir+Bustamante Danceworks. A large selection of this archive has been digitized by Anna Lamphear and Katie Thornton and other staff members of UT Libraries’ Preservation and Digitization Services. The digitized collection is hosted on Texas ScholarWorks. This symposium celebrates the public launch of the first phase of the digitization process: the videos! The paper archive will be digitized in 2017 as phase two of the project. Dr. Sharir’s office contained 671 individual video objects. Since the earliest was dated 1977, and the latest 2015, these objects embody four decades of video technology: U-matic (3/4″), VHS, Hi8, Betacam, Digital Video Cassette and Mini DV, DVD, and born-digital files stored only on hard drives: .mov and .mp4. Some of these 671 objects were labeled with titles and dates and choreographers and other pertinent information; some were not labeled at all. Some of the objects documented multiple dances, some from multiple events with multiple choreographers or dance companies participating; others documented a single dance. The major challenge we faced was how to balance efficiency and depth of coverage. We wanted to ensure that the digital collection represented as many unique dance works as possible, without wasting time digitizing duplicate tapes, but the inconsistency of visible information made this difficult. Also challenging: there was no way to tell if the physical object had degraded beyond use without playing/digitizing it at the PCL. In the fall of 2013, I created an inventory of most of the video items (we discovered more later on). I ordered the items chronologically (as far as possible), gave each a unique number (0001-0671), and made a spreadsheet detailing all “metadata” available at that point. Depending on the item, this could include: unique number, date, item format and brand, event title, individual dance titles, event type (rehearsal or performance), run time, dance companies, choreographers, venues and sites, videographers and their notes, performers, designers, musicians, composers, other collaborators, and notes. Sharir and I then began selecting “batches” of video items to send to the PCL, 20 at a time. We prioritized based on questions like “how old is this tape?” (older objects got priority); “how significant is this event/dance?” (Dr. Sharir, of course, was the expert of this); and “have we digitized any version of this event/dance before?” (new/unique pieces got priority). In January 2014, I delivered the first batch of 20 tapes to Anna and Katie in the PCL, where they worked their magic using lots of devices that I do not recognize or understand! I continued to deliver and pick up batches of tapes through the summer of 2016. Anna and Katie digitized 398 video objects between January 2014 and September 2016. WOW. After they uploaded each batch to the libraries server as .mp4 files, Dr. Sharir and I watched each digitized video. While he watched the dances closely, reminiscing about his fellow artists and considering the quality of the videography and lighting, I filled in the blanks of my spreadsheet, based sometimes on in-video credits and sometimes on Dr. Sharir’s recollections. Once he watched the video through, Dr. Sharir decided whether or not to accession it into the digital collection. He based this decision on the significance of the dances represented, the quality of the video (for instance, some videos lacked audio, and some had degraded over time), and whether we had coverage of the event in the collection already. We generally chose to accession subsequent nights of the same dance program, a collection-level acknowledgement that live performance changes in every reiteration. About halfway through the watching process, Dr. Sharir’s co-artistic director José Luis Bustamante delivered three crates filled with beautifully organized files of programs, press clippings, and season announcements. I am so grateful for this gift! Matched with Dr. Sharir’s files, it has allowed me to create a four-decade production history, and provide extensive credits and notes for almost every item in the digital collection. Once an item is chosen for the digital collection, I upload its .mp4 file to TexasScholarWorks, and add in all its metadata. On TexasScholarWorks, UT folk and the general public alike can search and browse the collection, view streaming video, and download the videos to their own drives. Each video is protected by a Creative Commons license (Attribution-NonCommercial-NoDerivs 3.0 United States). I take the digitized tapes to Beth Kerr at FAL, and she adds them to the physical Sharir collection located in off-site storage. This physical collection contains all digitized video objects, whether accessioned or not into the digital collection. It also contains all the video objects we decided not to digitize (usually because they were clearly duplicates of something we already had accepted). You worked closely with Dr. Sharir on this project; did he provide any impressions about the digitization/digital preservation of his work? He has found great joy in “re-view”ing his choreography and dancing over the decades, and in responding again to the work of the many extraordinary artists he worked with and presented/produced here in Austin and elsewhere. He shared many jokes and memories with me. Certainly the most poignant and somber touched on the lives of his artist colleagues who had died between the filming of the dance in the 1980s or 1990s, and the day we watched it again in 2015 or 2016. The Sharir Dance Company, like so many arts organizations, lost beloved members to the AIDS epidemic. We felt sometimes that we were watching ghosts dance. KVW: 3 years and 2 months since I began my work as (part-time) archivist. (But the project isn’t done yet—we have phase 2 still to complete). Add in more time before that (I don’t know how much) for Beth and Yacov’s work getting the project up and running and funded. Did you discover anything in the process that was either unexpected (either in the materials or cataloging), and can you reflect on the accomplishment and its value to the broader world? Having never participated in a archival process of this scope, I had no idea just how much time this work takes. It’s a major undertaking. Yacov is a treasure: of the dance world, of Austin and the UT faculty, of the Department of Theatre & Dance. His career has been hugely significant and influential, from his pioneering, inclusive work with Deaf and hearing dancers; to his artistic and production collaborations with artists like Merce Cunningham, Bill T. Jones, Deborah Hay, David Dorfman, Doug Varone, Margaret Jenkins, Tina Marsh, Allison Orr…the list goes on. It has been a privilege—and a real pleasure—to help make this important piece of dance history available to the public. I grew up and discovered theatre and dance here in Austin, and I’m proud to contribute to the preservation of the city’s cultural history. These were among the first words that Lorraine Haricombe offered to Libraries staff on her arrival one year ago, and that exhortation has been realized in large ways as a new strategic vision becomes reality. While some changes are more subtle, the way that the human resources of the Libraries are being adapted to the evolving needs of our users and to technological advancements is distinctive. New faces are filling positions that are outside the traditional library mold as a means of addressing new currents and new fields of inquiry in ways that take advantage of opportunities in the digital realm, as well as within traditional institutional frameworks. Over the past year, the Libraries have hired for a succession of new titles that were necessitated by adjustments in university priorities and developments in the practices of scholarship. One of the first moves made to reimagine the organizational structure within the Libraries occurred as the result of a vacancy at the Architecture & Planning Library, when head librarian Beth Dodd resumed her curatorial work in the Alexander Architectural Archive. Rather than simply refill the position as was originally planned, Haricombe worked with her executive team to adapt the title to a larger current in the field of digital humanities — an area of research and teaching at the intersection of computing and the disciplines of the humanities. The Libraries hired Katie Pierce Meyer as Humanities Librarian for Architecture and Planning both to take on a role as both administrative lead of the APL and also to focus on how to develop efforts in the digital humanities at a branch level that could be scaled to an organizational-wide scope. The Libraries were in the process of reviewing its gifts policy even before Lorraine Haricombe arrived, and early decisions about putting controls on the intake of unsolicited gifts meant that head of gifts processing Sean O’Bryan could be redeployed toward another important priority. Sean was hired to the position of Collections Strategist, where he has become the catalyst for development of a new strategic policy for collections management. His work now is core to the improvement of efforts to move from print to electronic resources. As African & African American Studies has joined the predominant fields at the university, the need for bibliographer support from the Libraries has become clear. Especially relevant to our existing resources is the growing focus on the African Diaspora in Latin America and the Caribbean, and with the recent attention given to our southern neighbors by UT President Greg Fenves, we recently hired Rachel Winston as Black Diaspora Archivist at the Benson Latin American Collection. Winston will work to enhance the Benson’s holdings while developing university collaborations to strengthen scholarship in this burgeoning field. The importance of digital collections and electronic resources remains on an upward trajectory, so there is a constant need to reconsider strategy for making the most of campus technology for institutional gain. Between the expansion of digitization efforts, the prioritization of Open Access, and the unabated growth of Big Data in research, finding ways to manage a new universe of information has become essential. Jessica Trelogan recently became our new Data Management Coordinator to build, maintain and enhance the data services deployed by the Libraries. She’ll work closely with our campus partners at places like the Texas Advanced Computing Center and Information Technology Services to ensure that we’re making the best use of resources across the Forty Acres. As digital collections continue to grow, the need has arisen for a dedicated custodian to manage both the born-digital and digitized materials that increasingly are the currency of library collections. Ashley Adair joined the Libraries Preservation Department last year as Digital Archivist to take over stewardship of digitized collections across its various libraries and archives, where she plays an active role in the acquisition, appraisal, arrangement and description of these modern core resources. Technology has also created new opportunities for study at UT, and not just in the STEM fields. The university recently announced the formation of a degree in Creative Arts and Entertainment Technology within the College of Fine Arts, and the students of that program will rely heavily on a space being developed at the Fine Arts Library. The Foundry — a digitally-focused maker space within the library — will feature a recording studio, fiber art studio, video production studio, gaming studio, digital media lab and more. To support the student needs both within the new program and across relevant technology and design studies at UT, the Libraries created a librarian position for Arts and Creative Technologies, and hired FAL veteran Boris Brodsky. Brodsky will be the custodian of the Foundry, and will build from scratch the liaison role that the Libraries have with students and faculty in this exciting new program. These are just the initial movements of a transformational time at the University of Texas Libraries, where we’re doing different things and doing things differently. There’s no doubt that the embrace of digitization by museums and libraries has significant benefit for the devotees of art history. The preservation of the cultural record from the degrading effects of time is the most utilitarian benefit of the practice, but archival digitization also allows for non-linear consideration of creative works in its ability to allow art to be partnered with other data, information, critical context, etc. Digitization is, though, limited by the sheer volume of historical works that exist and by that which continues to be created. Sometimes, the only sure way for art to be preserved digitally, is for a specific need to arise. Such is the case with the work of Sandow Birk, a visual artist in southern California, whose art contemplates modern American society with a nod to past masters. Earlier this year, UT College of Fine Arts Ph.D. candidate Rose G. Salseda began research for her dissertation by interviewing several artists who created artworks in response to five days of civil unrest caused by a jury’s acquittal of four white Los Angeles police officers who had been charged with the videotaped beating of Rodney King, a black motorist. “The Bashing of Reginald O. Denny” by Sandow Birk. 1993. Oil and acrylic on canvas, 28″ x 36″. Collection David and Pamela Banks (Little Rock, Arkansas). Along with Birk, Salseda had interviewed sculptor Seth Kaufman and graffiti artist Man One, only to discover that virtually none of the artists’ work from the 1980s-90s had been digitally preserved. In working with the Birk, Kaufman and Man One, Salseda was able to gain access to slides, photos and ephemera directly from the artists themselves. Salseda remembered from previous work with staff at the Visual Resources Collection (VRC) at UT that a library might be able to help her capture the imagery, thus ensuring that it would be preserved for both her use, as well as the use of future researchers. But she needed to find someone close by in Southern California that would be willing and able to assist. Salseda then followed up with Sydney Kilgore, media coordinator for the UT’s VRC — an actively growing collection of some 80,000 digital images of art and architecture located at the university’s Fine Arts Library — to see if it would be possible to ingest a selection of Birk’s work into the university’s digital media repository, the DASE (Digital Archive SErvices) Collection, for the benefit of students, faculty and researchers at UT. “American Qur’an Sura 9 B” by Sandow Birk. 2013. Ink and Gouache on Paper, 16″ x 24″. Salseda is currently working with Kaufman and Man One to secure digital images of their work for inclusion in the VRC, as well, which are expected to arrive next year. She believes that there is a larger history to be told by the art that was created in the wake of the unrest, but because of a lack of documentation, the story of the period has an incomplete context. It’s this personal, practical experience that Salseda had in the process of her own research that prompted some realizations about the temporality of art and the necessity of digital preservation. “I have come to realize even more the importance of digitizing images. These images are essential when original artworks are lost, reside in private collections, and/or are irregularly exhibited,” she says. An exhibition featuring Sandow Birk’s “American Qur’an” is currently on view at the Orange County Museum of Art. Sydney Kilgore, Rose Salseda and Thao Votang contributed to this article. Founded in 1867 by D. A. Sanborn, the Sanborn Map Company was the primary American publisher of fire insurance maps for nearly 100 years. A 2007 partnership with the Briscoe Center for American History resulted in a multiyear scanning project that made the Sanborn Fire Insurance Maps for the state of Texas and Mexico (1877-1922) available online through the PCL Map Collection. Over 10,000 maps were scanned primarily from the Briscoe’s collection, with additional items ingested from the most comprehensive collection of the maps at the Library of Congress, Geography and Map Division, in Washington, D.C. The information on the maps — which were published to determine fire insurance risks of particular buildings — has a multitude of uses for historians, urban planners, architects, social scientists, geographers, genealogists, environmentalists and anyone interested in the history and growth of cities. Maps include details regarding the shape and size of residential and commercial buildings, street addresses, block numbers and property boundaries, as well as type of construction, type of roof, building height, location of windows and doors, proximity to fire hydrants and alarm boxes. For many of the maps, multiple editions exist that allow for the study of change over time for a particular area. On June 9 — International Archives Day — the Libraries’ Human Rights Documentation Initiative (HRDI) partners Aegis Trust and the Kigali Genocide Memorial Centre launched a new, greatly updated and expanded online Genocide Archive of Rwanda (http://www.genocidearchiverwanda.org.rw). One of the most important resources online documenting the causes, processes, and consequences of the 1994 Genocide against the Tutsi, GAR demonstrates the generative impact that the Libraries’ programming can have. The HRDI project, begun in Rwanda in 2008, engaged staff and volunteers at the Kigali Genocide Memorial Centre, a museum and documentation center for education and memory in Rwanda, to combine their personal experiences, deep knowledge, and historical resources with the technical expertise at UT Libraries in order to preserve and provide access to the fragile record of the Genocide that was daily being lost. The first version of GAR, developed by the Libraries’ Technology Integration Services, Information Technology Architecture and Strategy, and Digitization Services departments using Glifos media software, was installed on a laptop and hand-carried by me and human rights archivist T-Kay Sangwand to Rwanda, where it spent the next year demoing the project to build local community, government, and international support. Launched online in 2010, GAR enabled people in Rwanda and around the world to hear testimonies from Genocide survivors as well as perpetrators and elders in Rwanda about their experiences of Genocide, its root causes, and the lives and society that it destroyed. Photographs and historical documents were collected and digitized by Aegis Trust’s Rwandan staff to be added to the Archive and preserved digitally by UT Libraries, and soon UTL was consulting on construction of a climate-controlled physical archive in Kigali in addition to the online digital archive. The new Genocide Archive of Rwanda moves the archive to the cloud and integrates new mapping features, improved access to documents and photographs, and interactive tours of memorial sites around the country. The new site also includes features to engage youth in peace-building, and highlights important community renewal and reconciliation programs. When recently retired Vice Provost Dr. Fred Heath and I attended the Kwibuka 20 commemoration ceremonies marking 20 years since the Genocide, Rwandan president Paul Kagame stated that, “Historical clarity is a duty of memory that we cannot escape. Behind the words ‘Never Again’, there is a story whose truth must be told in full, no matter how uncomfortable.” Born in the basement at Perry-Castañeda Library, and now managed in the cloud by a team of new information professionals in Rwanda, the Genocide Archive of Rwanda is a resource that preserves and gives clarity to the 1994 Genocide in support of memory, reconciliation, education, and scholarship in Rwanda, Texas, and around the globe. The global impact of the University of Texas Libraries is made possible in large part to the financial support of individual, corporate and foundation donors. To contribute to projects like the Human Rights Digitization Project, please contact Natalie Moore or visit our online giving page today. It’s certainly the case that our perception of the world’s geography is rooted in our experience with the maps we’ve encountered, developed and designed over eons by both hand and machine. Even though we may have become increasingly reliant on disembodied voices to lead us where we need to go, the archetype for understanding the concept of location which we carry in our minds was instilled by the road guides of family vacations, massive retractable world maps of the elementary classroom and spinning globes of our past. 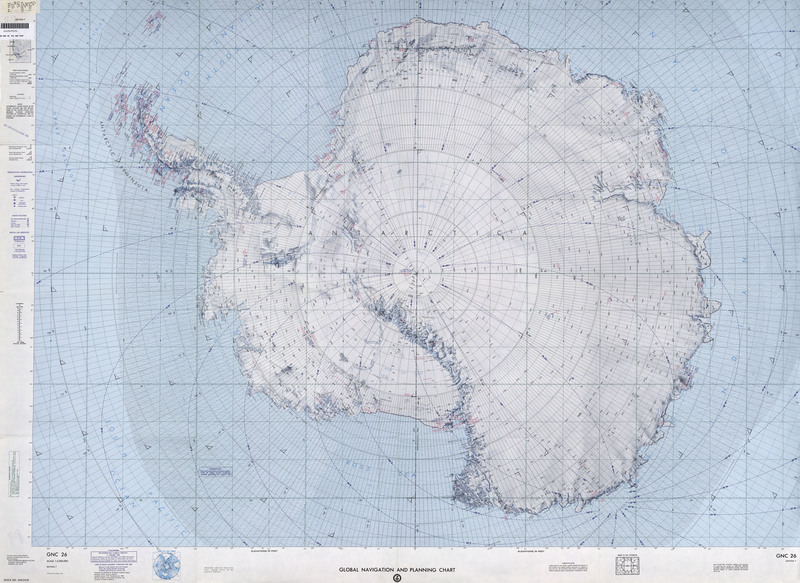 Equal parts art and science, maps are one of the most effective methods for conveying information visually in virtually any field of inquiry. In the miniaturization of space that is necessary to explain vast areas on a personal scale is a documentation of history and of change; of character and personality, value and values; of plant and animal; of health and illness, feast and famine; of motion and stasis; and of nearly any aspect of life and place that can be categorized for better understanding the world in which we live. PCL Map Collection manager Katherine Strickland assists a patron. And that, perhaps, is what makes the map collection at the Perry-Castañeda Library so incredibly valuable. Its scope in both size and subject is immense enough to maintain an intrinsic value — both as historical artifact and as a tool of modern research and reference — that goes unaffected by the passage of time. The university began informally collecting maps previously — at the General Libraries, but also through efforts at the Geology Library, the Barker Texas History Center and the Benson Latin American Collection — but it wasn’t until the PCL opened in 1977 that the Map Collection was established on the first floor of the building as an independent collection. The core of the collection emerged with the acquisition of the U.S. Geological Survey topographic maps, which date from the late 19th century and cover the entire United States, U.S. territories and other parts of the world where governments contracted U.S.G.S. for mapping, such as Saudi Arabia. 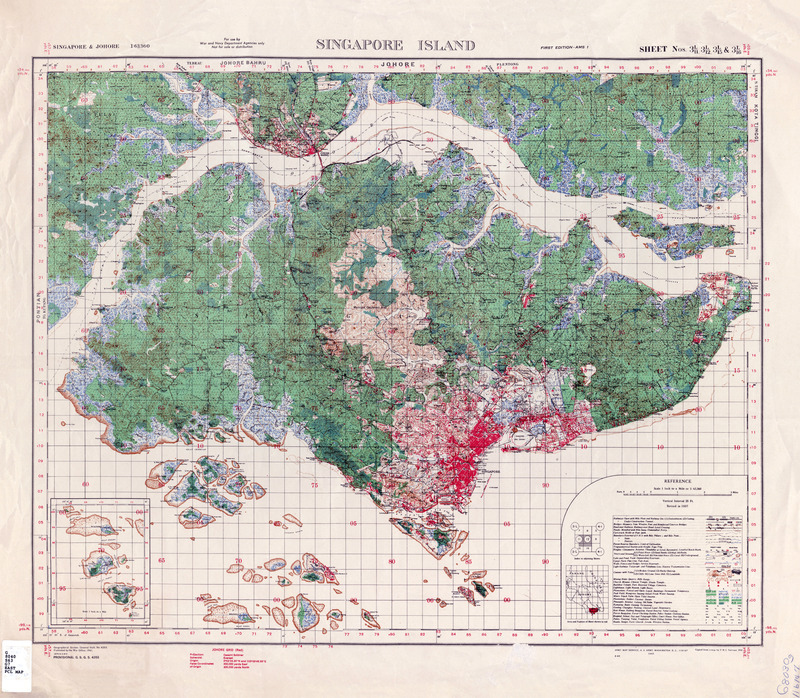 Topographic map of Singapore Island, 1941. Since then, the collection has grown to feature military maps from various conflicts around the world, government nautical and aeronautical charts, topographic collections, city maps representing over 5,000 cities around the world, aerospace navigation charts, data and demographic maps, and just about every other conceivable type of physical cartography. The collection also houses an extensive collection of atlases, from a street atlas of El Paso to the National Atlas of India. The library also purchases commercial and foreign government-issued topographic map series, country, city and thematic maps. The collection also includes a small but popular collection of plastic raised-relief maps and globes, not only of earth, but of the Moon, planets and other various celestial bodies. Most of the maps in the collection date from 1900 to the present, and the collection is constantly being updated with newer materials, and complements a number of significant historical map collections housed on campus in the Center for American History (historical maps of Texas), the Benson Latin American Collection, the Harry Ransom Center and the Walter Geology Library. Paul Rascoe — the Libraries’ Documents, Maps, & Electronic Info Services Librarian — has been the driving force behind the collection at PCL, especially in the formulation and execution of the collection’s online component. And it hasn’t hurt to have the planets align, at times. Georgia Harper is a legal specialist in copyright law and the Libraries Scholarly Communications Advisor. She has been closely involved in the Libraries partnership in the Google Book project since it began. A district court in New York made a determination last Thursday about which there has been enormous speculation for nearly a decade now: Is it fair use for Google to scan tens of millions of books, many of which are still protected by copyright, and provide snippets of the text of those works to users of its search engine in response to their queries? Judge Denny Chin says it is. There it will stand for the moment. The Authors Guild says it will appeal to the 2nd Circuit in hopes of a reversal. UT Libraries is a partner in the Google Books project, so we are elated by the decision. We have long argued that scanning for the reasons Google scanned our books, among many other libraries’ books, is fair use, but it is the nature of fair use that reasonable minds can disagree about its scope. So you usually hold lightly to your opinions. You never know when you’ll be shown to be wrong. But, there has been a rather nice string of court decisions since the mid-1990’s, beginning with the “Pretty Woman” case (Campbell v. Acuff-Rose), strengthening the fair use doctrine when the use is transformative — that is, when it adds something new, provides new context, or brings the work to new audiences for a different purpose. So, the question becomes, most importantly, “Is the use transformative?” If it is, courts are much more likely to declare it a fair use, assuming it meets the other criteria for a fair use. Judge Chin’s decision explores these criteria, and the weights of public benefit and harm to economic incentives in his decision, which I recommend you read. It usually comes down to this: does the benefit to the public (usually a speech-related, First Amendment benefit) outweigh the harm to the copyright owner’s reasonable expectation of commercial exploitation of her work? I’m happy that for now, we are confirmed in our opinion that here, it does. Illustration on the properties of numbers from the Sumario Compendioso (1556), the first math text published in the Americas. The Primeros Libros project is thrilled to announce the incorporation of two new partner institutions: the Biblioteca General Histórica at Spain’s prestigious University of Salamanca, and Mexico’s Biblioteca Francisco de Burgoa at the Beinto Juárez Autonomous University of Oaxaca. These two new additions bring the total number of Primeros Libros partner institutions to 17. The Primeros Libros project, of which the University of Texas Libraries and Benson Latin American Collection are founding members, seeks to digitize the first books published in the Americas, focusing initially on works published in Mexico in the 16th century. Each participating member library is entitled to a full set of the digitized exemplars of all partners as part of the project’s innovative preservation and access strategy. The project inventory currently includes 248 exemplars. The University of Salamanca will bring 11 exemplars to the project, including five titles not previously covered by the project. One of these is the Sumario Compendioso de las Cuentas de Plata y Oro que en los reinos del Perú son necesarias a los mercaderes y a todo género de tratantes. Published in Mexico City in 1556. The Sumario Compendioso is the first non-religous text produced in the Americas and the first scientific text published outside of Europe. It was written primarily for merchants and miners involved in the silver and gold trade out of Mexico and Peru as a practical guide to help them manage their transactions, a sort of early precursor to the calculator. The Sumario contains tables that made it easier for merchants to get numerical values without having to do extensive calculations by hand, but there are also sections on algebra and quadratic equations. The addition of the University of Salamanca’s digitized version of the Sumario Compendioso to the Primeros Libros project is also important in terms of the repatriation of cultural patrimony to Mexico, one of the key goals of the project, since there are only three known surviving copies of the book in the world, none of which is in Mexico (the Salamanca copy, one at the British Library, and one at the Huntington Library in Los Angeles). All seven Primeros Libros partner institutions in Mexico will now be able to feature this digital copy of the Sumario Compendioso as part of their local collections. The Biblioteca Burgoa brings nine additional exemplars to the project. One of these, the Institución, modo de rezar y milagros e indulgencias del Rosario de la Virgen María, represents the only copy of this work in the project to date. On September 19 and 20, the Biblioteca Burgoa will be hosting the annual Primeros Libros Partner Meeting in Oaxaca. The program for the Oaxaca meeting includes presentations by Benson-LLILAS Digital Curation Coordinator Kent Norsworthy and University of Texas at Austin School of Music professor Dr. Lorenzo Candelaria. In the case of original Latin American research materials, quite a lot, actually. The John Carter Brown Library at Brown University has signed on to the Primeros Libros project – a consortia-driven effort to capture and preserve as many of the “first books” of the New World, those printed in Mexico before 1601. Brown becomes the project’s biggest contributor bringing an additional 70 volumes to the collection, joining the Benson Latin American Collection, Biblioteca Histórica José María Lafragua at the Benemérita Universidad Autónoma de Puebla and the Cushing Memorial Library and Archives at Texas A&M University, among others. The digital preservation of these historic cultural documents not only benefits Latin American study abroad, but it means that long-since scattered cultural artifacts of Mexico can return home for use the country’s own scholars and researchers. Find more information on the project and its players here.